You know you've been playing way too much poker when you're in the queue at Tesco and begin doing chip tricks with 2 Euro coins. I found myself doing that this week and thought to myself "Good God!! What am I like? Will there be just one day for the rest of my life that I don't spend a moment thinking about poker?" I'd have to say, no, probably not. While at a friend's wedding this weekend the groom, who was naturally nervous on the morning of the biggest day of his life, decided to calm his nerves by playing a heads up match with the best man! It was my entire fault. I was the one who was sad enough bring chips, cards and even a dealer button to the wedding. 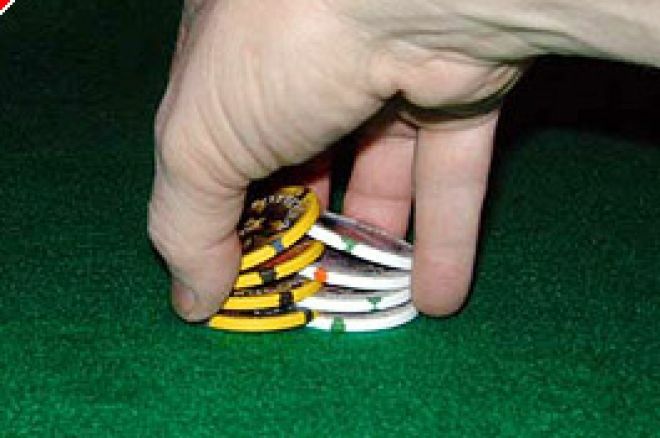 One thing I'm certain I will never do is forget the order of the poker hand ladder. I'll never forget that a flush beats a straight, A set beats 2 pair and that Queens are better than Jacks. You can't get through a single episode of Late Night Poker without being reminded of it. If any self respecting poker player was to forget it I'm sure they'd immediately give up the game for life through shame. But, if you were playing on Betfair last week and you've since quit poker for this very reason you might want to reconsider, as it appears Betfair themselves completely forgot to consult the poker ladder before launching their new software. Players were pinching themselves when they saw pots being awarded to the losing hand at the Omaha cash tables. It's a good thing I haven't used that USB stick Betfair gave away recently in PokerPlayer magazine. My laptop might explode or worse my pokernews articles might disappear! If Irish Professional snooker player Ken Doherty was to forget that the brown ball is worth more than the green I'm sure he'd never live down the embarrassment. He proved himself to be a man of many talents last weekend in Dublin when he captured the Inaugural 4 Nations Charity Heads Up Championship held at the Fitzwilliam Card Club. This was a team event with 32 players male and female from England, Wales, Scotland and Ireland. Ken defeated England's Kevin Conway in the final battle. Mike Lacey of Green Joker Poker, who also sponsored the Irish, captained the Team. On the 27th of November Green Joker Poker will launch their first festival at the Boyne Valley Hotel in Drogheda. The main attraction will be a €1000+75 buy-in 3-day event with a 15,000 starting stack and a 1-hour clock. This will also be a European ranking tournament and looks to be one of the best value events in Ireland this year, and a refreshing change from the long list of poorly run events that have been held in hotels throughout Ireland so far in 2006. In other poker news this week World Champion (or so I keep hearing) Jamie Gold, stepped up his attempts to renege on his promise with former UK executive TV Producer, Bruce Crispin Leyser, to split his WSOP winnings. He has put forward a motion to dissolve the injunction on the $6,000,000, which is currently being withheld by Harrah's and requested an immediate hearing to resolve the dispute. Gold openly admits to making the promise to Leyser to give him 50% of his winnings, but since he believes he is under no legal obligation to actually fulfill his promise, he's decided he'd rather just keep the money! God bless poor Jamie. I'm sure he's had a lot of stress over this whole fiasco. Considering what he has had to endure, $6,000,000 is only fair compensation for having to face constant criticism over his lack of integrity, something that no previous World Champion has ever experienced.